As a child I heard my elders spoke about those who were considered important to the world. I learned that I was to respect my teachers who were considered the most highly respected individuals in the back country of Mobile, Alabama. My father taught me this. He said, ‘Teachers walked through town like Presidents. ‘And if you disrespected a teacher, you suffered a fate at the hands of your parents you wouldn’t easily forget. But above teachers was the minister of the church. This lesson was close to home since my father’s father, my grandfather was a minister. For our community that meant he had huge status and respect. In my college years I learned about Gandhi, Mother Teresa and I was old enough to suffer the pain of losing the iconic Rev. Dr. Martin Luther King, Jr. These were the individuals who held prominent places in our history books and I understood that each one of them had made great contributions to improving the lives of others and changing the human condition, predominantly through religious teachings and methods of non-violence. It was in Middle School that my talent for writing emerged and received accolades from my teachers. My first published piece was included in the Senior Yearbook. I did not quite understand how what came out of my thoughts could translate so well onto paper. Writing to me was a very solitude and personal activity that I embraced as a lonely child who was sheltered from the ravages of my neighborhood. So time alone in my room not only protected me from harm, drugs and violence, it gave a young girl an imagination, creativity and a way to express myself without really saying it out loud. There were times that I was consumed by fear, afraid of everyone and the world outside my home. It was secure there and even my daily treks to school brought painful reactions because I did not want to leave my happy place. Children were cruel to me and teased me constantly because I looked different, Pocahontas braids, party dresses with big slips, lace anklets and patent leather shoes. I looked ready to attend Miss Betty’s Prep, rather than P.S. 136Q where I hated every minute I was in the building. So what did I do? I cried – every day – all through school. I never spoke unless I was questioned in those early years. I shut down, eyes to the ground and never looked anyone in authority in the eye. So what a surprise to me to have read about Maya Angelou’s years of silence also. It amazed me to read this so many years after I had admired and read so much of her work. How could the conditions of the world have robbed her of the desire to speak? We found out what propelled her into this existence of silence, but only she knows the pain and suffering that would find Ms. Angelou seeing no reason to speak. 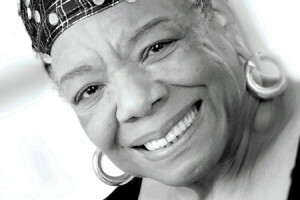 I am so glad that one day God said ‘enough’ and we got to hear Maya Angelou speak. Coming home to love each day to the three generations of women in my house, my grandfather walking me to elementary school each day and on really bad days, standing outside the window the entire school day, can only be categorized as true love. Imagine this world if we had be robbed of the sound, the deep bravado, alternating lightness of laughter in the voice of the late great Maya Angelou? Ms. Angelou was not spoken of in the history textbooks as a civil rights leader, spiritual leader or leader of the free world. She held a position higher than those we deem our leaders of the community because she reached the world through her words, her love of life and her subliminal influence into the minds of the most influential people on the planet.